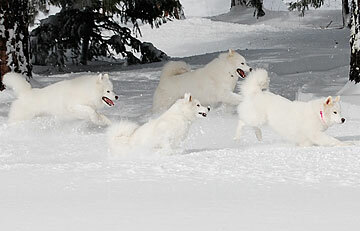 Stormy follows her dad, Lightning, through deep powder on a hillside. 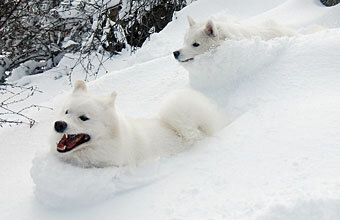 It looks as if they are bodysurfing through the snow. These two could have done this all day long. At a year and a half old, Stormy has become a very powerful dog! 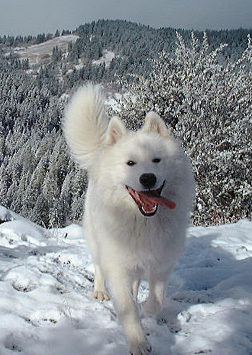 Nimbus enjoys his romps in fresh snow. 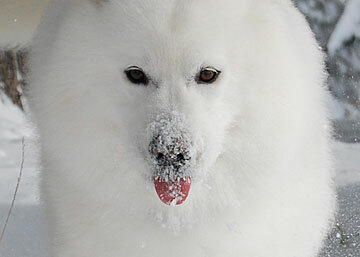 This picture shows him tasting snow that stuck to his nose while free-running in our nine acre fenced yard. 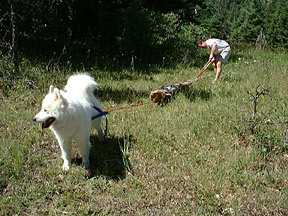 The dogs love to explore this spacious area populated by trees, rocks, and the occasional rabbit. Lightning turned two-years old on February 16, 2002. To celebrate, we thought it would be nice to let him do something that he enjoys. 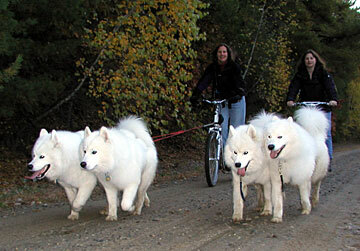 So we loaded him, along with our mountain bikes and his younger brother Nimbus, into the truck. We drove to an abandoned airfield in California. 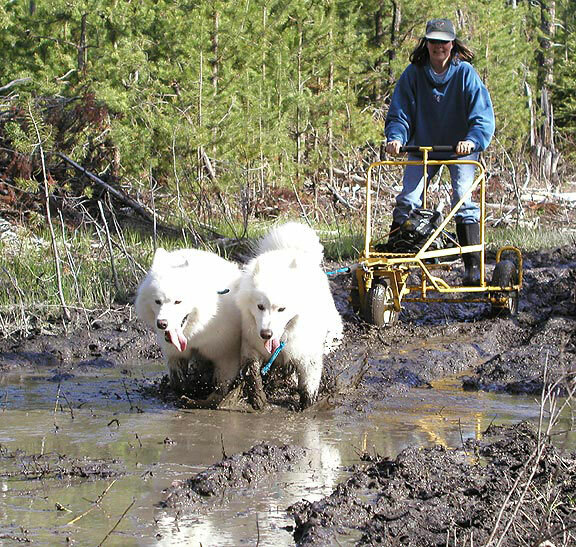 This expanse of land is flat, fenced, and secluded. 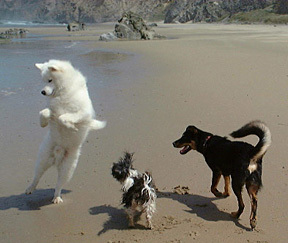 It was a perfect spot to let the boys run free. We had 30 mile per hour winds at the airfield on Lightning's birthday. 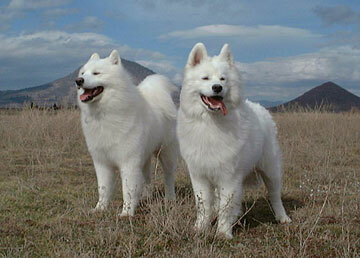 The boys are facing into the wind in this picture (Lightning left, Nimbus right). 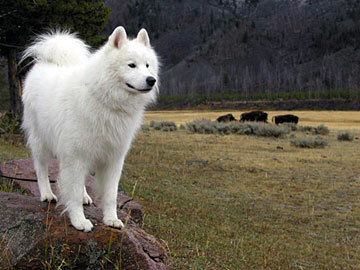 The dog's fur looked incredible as it was moved by the wind. 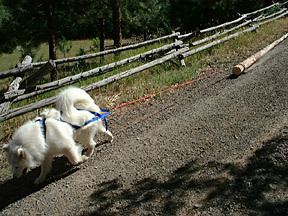 This image shows Lightning's effortless flying-trot with the high winds coming from behind him. 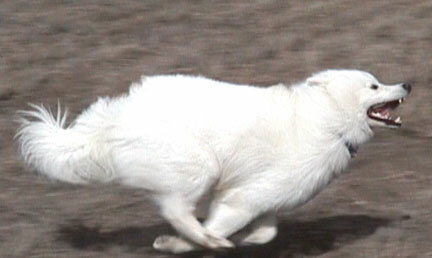 He generally achieves just over 14 miles per hour before he breaks from a trot to a lope. Here is something that Lightning loves to do. At a flat-out gallop, he sails through the air. He can really cover a lot of ground quickly! On the drive home, we stopped and both dogs got an ice-cream cone to further celebrate Lightning's big day. 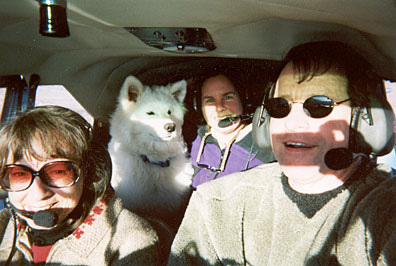 Nimbus went for his first airplane flight today. The little guy took to it well, looking out of the window and eating yummy treats. Here we are about 3,000 feet in the air. The shadow on Paul's face tells the story of how this picture was captured. 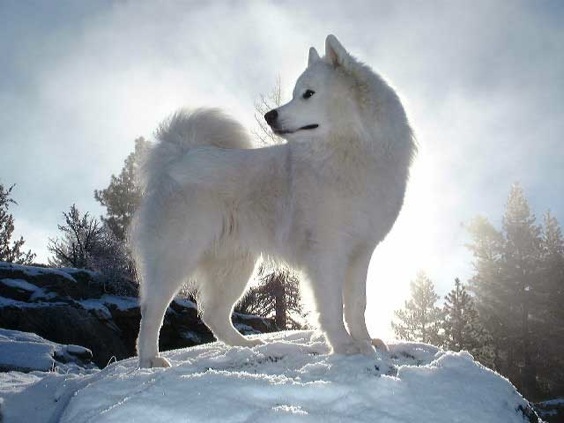 Snow crystals float in the early morning air and surround Lightning as he surveys his domain. Our 10 month old puppy loves to play in the fresh snow, sometimes persuading us to get an earlier start on our daily adventures than we had planned. 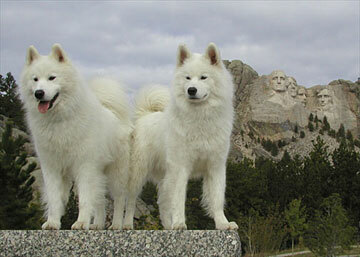 This image won 1st Place in the art show during the 2002 Samoyed Club of America National Specialty! 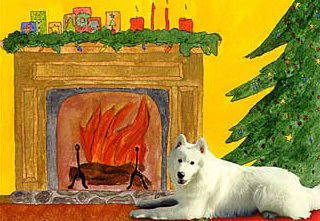 Lightning was featured on a card titled "By The Fire", designed by Beth Bloch Creative Cards for her 2000 holiday series. Beth skillfully merges photos with watercolor, creating whimsical and often amusing scenes. Her art is available on greeting cards and other fun items. Lightning was eight months old when Beth captured his likeness for this fun card. 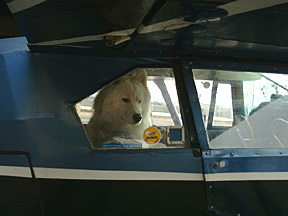 Lightning had his first experience flying in a small airplane in November of 2000. 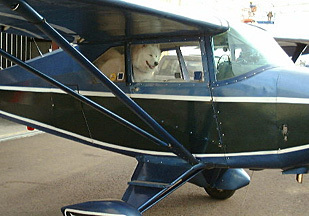 He was a little nervous during take-off, looking out the window and poking us with his nose. 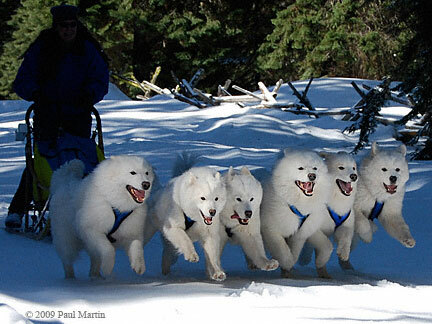 Once we were airborne, the treats came out. 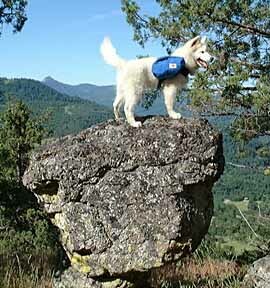 He wagged his tail and gazed at the miniature buildings, cars, and landmarks below. 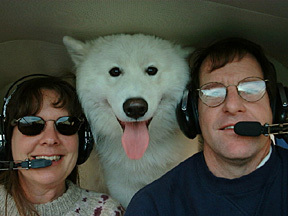 Here are Linda, Lightning, and Paul inside the airplane together. Lightning has his front paws resting on our seat backs. There is a bench seat behind us for the puppy (or human passengers). 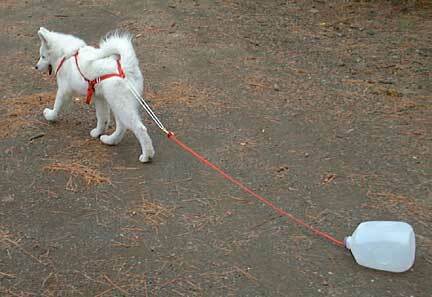 Our flying puppy was a real trooper. What a pleasure to fly with such a confident, well mannered dog. 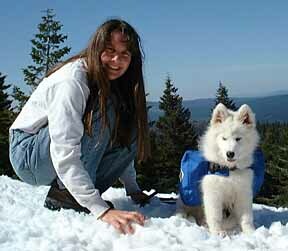 Lightning's first true snowfall came in mid-November when he was eight and a half months old. About four inches had fallen. A sunny window shone through the clouds for a moment, so we decided to drop everything and go for a walk. 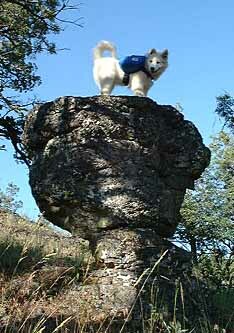 This photo is taken on The Point - the top of a cliff popular with local rockclimbers. 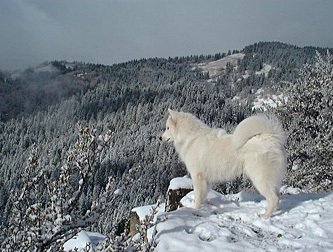 Lightning was attentively listening to a howling Siberian Husky 600 feet below. As you can see, Lightning loves snow. 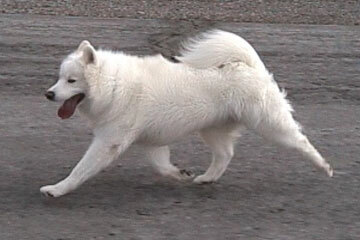 He was a blur of white on white, barely visible but for his black nose, eyes, and lips, and that pink tongue. 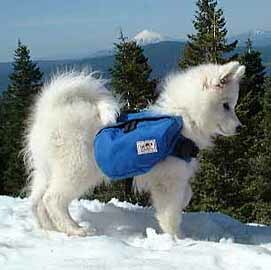 It should be very exciting for our pup after we get solid snow cover and the skis come out of storage. Lightning visited Washington DC, and seemed to enjoy the majesty and beauty of the park-like grounds. 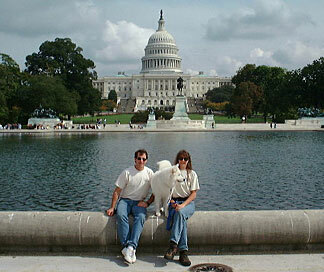 Here Paul, Lightning, and Linda are sitting on the edge of the pond in front of the Capitol Building. We walked toward the Capitol admiring the incredible bronze sculptures along the way. 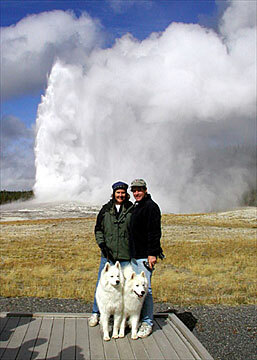 We were discovered by an adorable young lady who was delighted by Lightning's soft, waving tail. Our puppy was wearing his ID Cape with "Ask To Pet Me - I'm Friendly" and "Therapy Dog" patches, made by our company Wolf Packs. 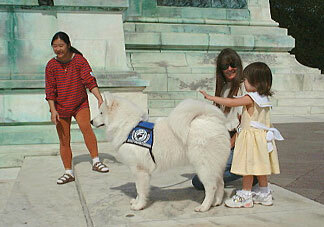 He was hugged and petted by many children that day, which he really enjoyed!